Our boxing gym bags are perfect for transporting your gear from home to the gym or your next fight. Our boxing equipment bags allow you to keep your equipment organized with multiple pockets, meaning that you don’t have to keep your mouthguard next to your boots. Our bags come with vented shoe sections to allow your boots to dry out after a hard training session. Many also feature internal privacy pouches to keep your personal items safe. Whether you’re years into a fighting career or just boxing to stay in shape, the convenience offered by a boxing gym bag makes it a smart investment. 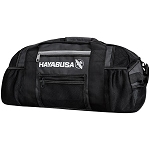 Our boxing equipment bags offer more than enough room to get all your gear from place to place in an organized fashion.